Last years iPhone 6 came with 1GB of RAM and Apple has given their new iPhone 6S a number of hardware upgrades, one of those is double the RAM of the iPhone 6, the 6S comes with 2GB of RAM. 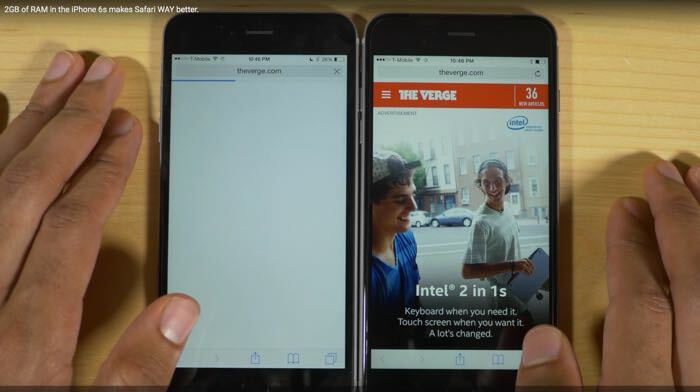 If you have been wondering what sort of difference the 2GB of RAM makes to the new iPhone 6S, have a look at the video below. As we can see from the video the 2GB of RAM whilst using Safari on the new iPhone 6S appears to make a considerable difference to the browsing experience. Other upgrades on the new iPhone 6S and 6S Plus include a faster Apple A9 processor and improved graphics. The new iPhones also comes with an improved 12 megapixel camera and Apple new 3D Touch Force Touch display.